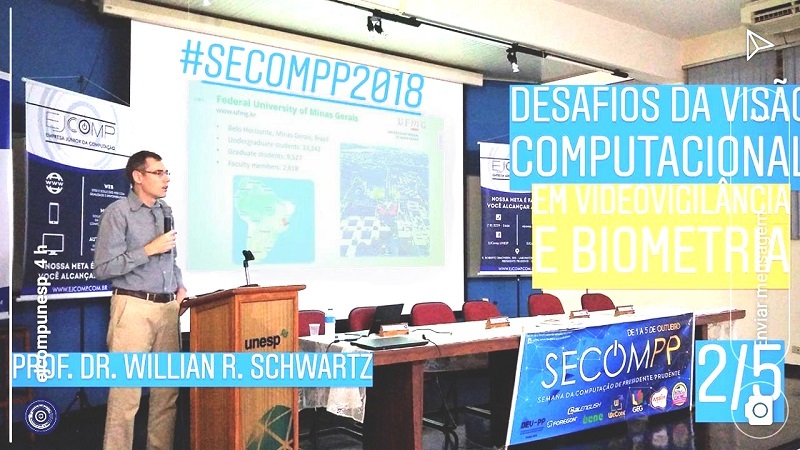 This Tuesday (2), the amphitheater of the Faculty of Science and Technology of the Universidade Estadual Paulista (UNESP) hosts a talk by Professor William Schwartz, head of Smart Sense Laboratory, in the 7th Computer Science Week of Presidente Prudente. Closing the activities scheduled for the day, his talk will address the challenges of computer vision in video surveillance and biometrics. Computer vision techniques applied to video surveillance and biometrics have been investigated for many years in order to develop intelligent and efficient surveillance systems for deployment on real-world environments. In this area, the main objective is to analyze the scene to recognize and understand suspicious human activities. However, video surveillance and biometrics still face several challenges, such as the large amount and poor quality of the data, which leads to small and noisy visual patterns. In his talk, Professor Schwartz discusses these major issues and presents ongoing research addressing these topics. About his participation in the event, he commented: “it is an opportunity to disseminate the work carried out at Sense and present students with research opportunities in the field of visual computing”. Associate Professor at the Federal University of Minas Gerais, William Robson Schwartz holds a Ph.D. in Computer Science from the University of Maryland. In his trajectory as researcher, he investigated mainly computational vision and machine learning applied to video surveillance, forensic analysis and biometrics. Schwartz is the coordinator of the Smart Sense Laboratory, which focuses on large-scale surveillance based on visual and sensory data. He advises several graduate students and has projects funded by agencies such as CAPES, CNPq and FAPEMIG, and companies such as Petrobras, Samsung, Hewlett-Packard and Maxtrack. Started yesterday (1) and with activities planned until Friday (5), the program of the 7th Computer Science Week of Presidente Prudente (SECOMPP) includes discussions, mini-courses on topics such as HTML, CSS, Python, educational robotics and deep learning, and talks on computer vision and machine learning.